We have a strong following for vintage and collectible Scalextric cars. We offer a free valuation service to people who are considering the sale of their items through our auction room. Click the button to complete our short form, and one of our valuers will be in touch. In 1952, ‘Freddie’ Francis invented a metal racing car which ran on a unique clockwork motor, and marketed it as ‘Scalex’ via a small company called Minimodels Ltd. Although initially popular, the toys were similar to those already on the market and Freddie decided to update them to include an electric motor. The new version ran on a rubber track with parallel grooves over a metal rail that conducted the electricity. The new system was unveiled at the Harrogate Toy Fair in 1957 as Scalextric (‘Scalex’ plus ‘electric’). In 1958, unable to keep up with demand for the new toy, Minimodels Ltd sold out to Lines Bros Ltd, who traded under the name ‘Tri-ang’ and converted the metal cars to plastic versions which were easier to produce. Tri-ang introduced many improvements to the controllers and track, and introduced a range of different cars and even motorcycles. Lines Bros Ltd was eventually taken over by Hornby Hobbies, which continue to produce several ranges of Scalextric models today. 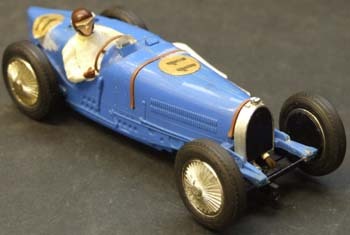 Early Scalextric sets are prized by toy collectors, in particular the early metal cars from pre-1958, as are limited edition sets and rarities such as the James Bond Aston Martin released in the mid-sixties as part of a set, and the 1964 C70 Bugatti Type 59. Other popular models include Auto Unions and vintage Bentleys. Colour is also an important factor when determining value, with yellow cars being the most sought after. The value of Scalextric is largely dependent on the age, condition and rarity of the individual set. As the cars were made to be played with, older examples are commonly damaged in some way, but if the set is still complete and in its original packaging, that can add greatly to the value.